Published just this month in the International Journal of Toxicology, the study “Glyphosate Commercial Formulation Causes Cytotoxicity, Oxidative Effects, and Apoptosis on Human Cells: Differences With its Active Ingredient,” proposes what most of us have already surmised: Glyphosate, the main ingredient in Monsanto’s herbicide du jour – RoundUp – is utterly killing us. 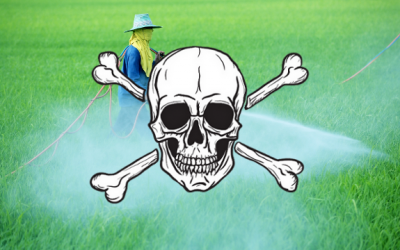 What’s more – it kills us in much smaller servings than the Agriculture industry is dishing out in its common GMO and pesticide spraying practices, and it is made stronger by the additional chemicals used in the RoundUp formula. “Aminomethylphosphonic acid (AMPA), and a glyphosate formulation (G formulation) were examined in HepG2 cell line, at dilution levels far below agricultural recommendations” and they are causing toxic effects on the human genome. It is the adjuvants in RoundUp working together with the glyphosate which really causes the problem. As many scientists have suspected, glyphosate does not reveal its true toxicity alone – but works in tandem with the other chemicals in RoundUp so that the levels of toxicity on human cells becomes catastrophic. One plausible cause is that the surfactant polyoxyethylene amine within Roundup dramatically enhances the absorption of glyphosate into exposed human cells and tissue. “. . . Here we demonstrate that all formulations are more toxic than glyphosate, and we separated experimentally three groups of formulations differentially toxic according to their concentrations in ethoxylated adjuvants. Among them, POE-15 clearly appears to be the most toxic principle against human cells, even if others are not excluded. It begins to be active with negative dose-dependent effects on cellular respiration and membrane integrity between 1 and 3ppm [parts per million], at environmental/occupational doses.